We suggest you have a hearty breakfast at your hotel this morning as you will spend the whole day hiking the great wall which is a huge physical exertion. Lunch is not included. You need to prepare it for yourself the day before. 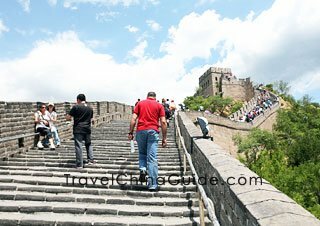 Our guide and driver will pick you up at your hotel lobby in the early morning and transfer you to the Great Wall at Badaling. As the most original and best preserved section, Badaling has become one of the must-see places for travelers who first come to China. Hiking the wall is a once in a life time experience and the spectacular view from the wall is overwhelming. 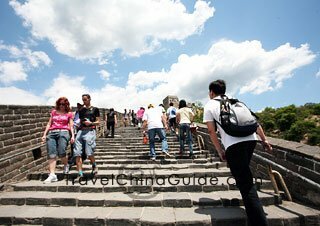 Upon arrival, our guide will accompany you to start the hike from the North 1st Watchtower and the tour will be finished after visiting the Great Wall Museum. Finally you will be driven back to your hotel with our private transfer. If you would like to do this hike on your own, kindly refer to the following route. 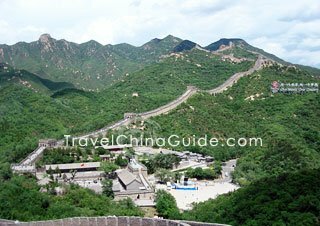 Highlights: Badaling is the best preserved and a very typical section of the Ming Dynasty Great Wall. Transportation to the attraction is convenient and fast, and the paths on the wall are easy to cover compared with other sections. A hiking trip to this section is suitable for inexperienced hikers, those who have limited time, and travelers who plan a leisurely tour. Get up early and have a good breakfast before departure. We would recommend that you get to Badaling by bus. You can take the bus no. 877 from Deshengmen Arrow Tower. It takes about one hour, and the bus fare is CNY 12 per person. There are 19 watchtowers open to visitors, including seven in the south and 12 in the north. Our hike starts from the North 1st Watchtower. The path to the north towers is gentle but longer than that to the south watchtowers. Going up from the first to the third tower and then on from the third tower, you have to descend first and climb another 100 or so steps to the fourth tower. Continue going up to the fifth watchtower, where you will find many arches. This is a two-floor tower and there are more than 30 arches under the second floor. These arches were used to watch the enemy, now they are windows for hikers to enjoy the majestic wall and beautiful scenery. It takes about one hour to finish the first five towers, and you can have a short rest there. Continue your hike to the North 6th Watchtower. 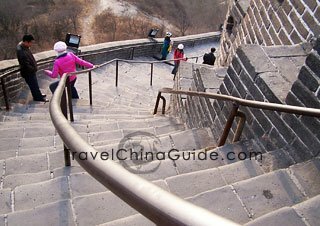 It is one of the largest on the Great Wall, and you can go to the top from the ladder inside. When you reach the North 8th Watchtower, you are at the highest point of the wall. The tower is 888 meters (2,913 feet) above sea level, and it is the best point to the view the wall and to enjoy sunrise or sunset, thus it is also named Sun Watching Tower. For photographers the tower is an ideal venue to capture the view of the majestic wall snaking along the mountain ranges. After a photo stop at the eighth tower, you start to go downhill. When reaching the North 10th Watchtower, you will find it is different from the other towers: on the top of the second floor there is a small garret. In ancient times the garret worked as a temporary bedroom for the garrisoned soldiers. Your hike along the wall stops at the North 11th Watchtower. Have a break there and take some photos, then go down the mountain from the path nearby. 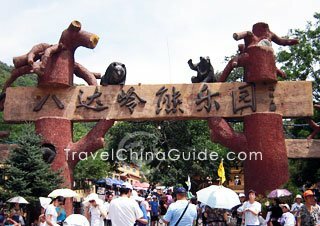 The Bear Garden is at the exit of the Great Wall scenic area. 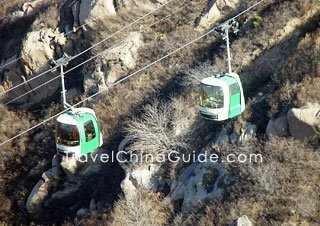 It is included in the entrance fee to Badaling. Over 300 black and brown bears live there. Visitors can feed them with fruit and vegetables. After your visit walk to the main road and continue to go north for about 1 km (0.6 miles) to the Great Wall Museum. You will see documents, pictures, models, and historic relics relating to the Great Wall and have a better understanding of this great manmade wonder. A surround screen theater is next to the museum, where you can see a 17 minute movie about the Great Wall in Chinese, English, and Japanese. The cost for the movie is CNY 40 per person. Return to the city by bus again. The buses back to Beijing City run every few minutes. 1. Wear suitable shoes. Take some water, snacks, and fruit with you, as there are no restaurants or shops on the Great Wall. Sunglasses, sun cream, and hats are necessary on sunny days; while gloves, scarves, and caps are useful in winter. 2. Toilets are available at the entrance and the exit of the attraction, so please be prepared before hiking. Remember to take toilet paper with you. 3. The fruit and vegetables provided in the Bear Garden are charged CNY 3 per plate. Do not touch them if you do not want to feed the bears. And then have a flight booked from PEK via Guangzhou and then onto Cambodia from there? Would I be eligible for the 144 hour visa? I am Australian and my travel companion is British. Flight arrives in Beijing at 6am and we have a 7 hour layover. 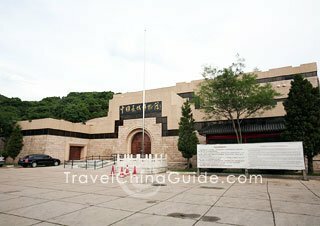 Is it possible to visit the Great Wall in that time frame? What are the options to get there? It is not enough for you to visit the Great Wall with only 7 hours of layover at Beijing airport. 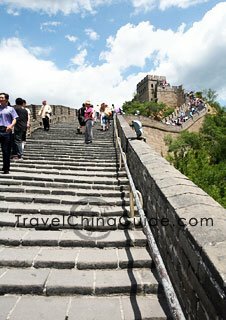 If you would like to go to Badaling Great Wall, it may take about an hour and a half one way, and you still need to return to the airport about 3 hours ahead of your next flight schedule. Therefore, it is not feasible to go to the Great Wall within such a short time. A visit to the Great Wall can only be considered if you stop at the airport for at least 10 hours. If you insist on leaving the airport, you are suggested to have a brief trip to Tiananmen Square. You can take the airport bus line to Dongzhimen Station first and transfer to Subway Line 2 to Jianguomen Station. Then transfer to Subway Line 1 to Tiananmen East Station and get out of exit B. Please leave sufficient time to return to the airport. Hope you a nice journey! I am coming from Bali and stopping in Beijing for 59 until my Flight to Miami, US. Will I have any issues on this stop over? No. You qualify for the 144h twov in Beijing. We 2 adult are planning to arrive beijing south station 12:33 pm by early morning (7am) bullet train from shanghai hongqiao. 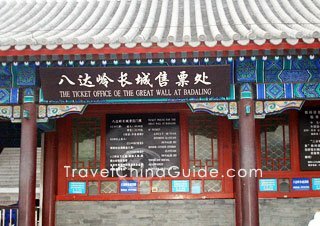 Do u think, it is possible to cover badaling hiking great wall with bear garden and great wall museum after arriving at 1pm at beijing south station, as then we have to catch overnight train to shanghai. 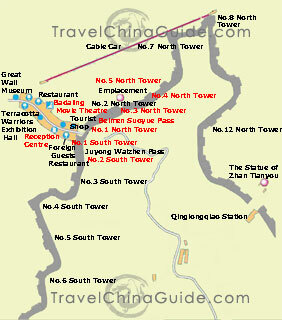 How much total time required to cover badaling hiking + bear garden + G W museum...? I think it is impossible to cover Badaling with Bear Garden and the Great Wall museum after arriving at 1pm. 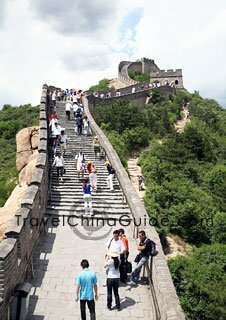 According to my experience, you will need 20-30 minutes to get out of the train station and another 1.5 hours to transfer to the Great Wall by car. There is no much time left for visiting. If possible, I would suggest you visit the sites the second day as it needs at least half day for these three spots. 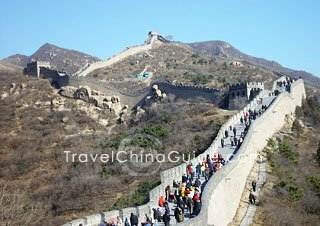 i wonder if it was possible to visit ming tombs and badaling great wall with bus in one day. take bus 314 to visit sacred way -dingling -and changling ming tombs but with bus to go to the great wall and were would it leave? from dingling or changling? Oh, both sies are worthy. 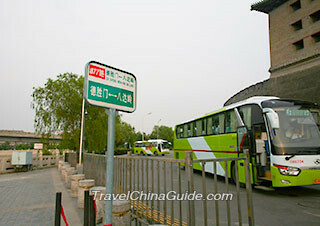 After visiting Ming Tombs, take bus no. 879 at Dingling to Badaling in 70-80min. Or you can take a taxi instead and it costs CNY120 or so. In this way, you can save some time and see more of the Great Wall.